Culms: Triangular, smooth, light brown or green, purplish near base, much exceeded by upper leaves and bracts. Leaves: Flat, dull green, up to 24 inches long, 1/6 to 3/5 inch wide, tapering gradually to narrow tip, glabrous; margins rough. Ligules: Usually longer than wide. Inflorescences: Spikes, unisexual; terminal spike usually 1, staminate, linear, 1 to 3.5 inches long, less than 1/6 inch wide, nearly sessile to long-stalked; bracts leaf-like, somewhat shorter to much exceeding spike; staminate scales linear to lanceolate, straw-colored; center green, several-nerved; margins transparent; tips tapering to long points or short-awned; lateral spikes 1-6, large, pistillate, oblong to oblong-cylindric, .8 to 2.8 inches long, .5 to 1.2 inches wide, sessile or with stalks up to 7 inches long, densely flowered; pistillate scales lanceolate, much narrower and usually shorter than perigynia, straw-colored; center green, several-nerved; margins transparent; tips tapering to long points or rough-awned; perigynia .2 to .6 inch long, less than .2 inch wide, rounded at base, green or yellowish-brown at maturity, strongly ribbed; beak long-tapering, about half length of body, 2-toothed. Fruits: Achenes, triangular, 1/6 inch long, less than 1/8 inch wide, 1-seeded; stigmas 3, short, blackish. Habitat: Stream and pond edges, lake shores, marshes, swamps, ditches, and wooded ravines. 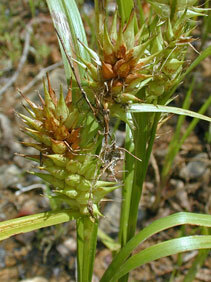 Comments: Hop sedge grows in tufts and is somewhat variable.